Q: Why is 1.3 the multiplier for a 30% increase? How do we find the multiplier? Let's review what a multiplier is. Say I have some number "x." A "multiplier" is a number I multiply by x in order to take a certain percentage of x or increase or decrease x by a certain percentage. Now, that's just taking a percentage "of" x. If we want to *increase* x by a percentage or express a percentage more than x, we just add the percentage increase to 1. So 1.7x represents a 70% increase in x. 70% decrease in x = 100% of x - 70% of x = 1x - 0.7x = (1 - 0.7)x = 0.3x So 0.3x represents a 70% decrease in x. Notice that this multiplier .3 is the same as (30% of x). This makes sense, because 1.3x is greater than x, and when we increase x by 30% we should have more than x. So if we had 100, 30% of 100 would be 0.3 * 100 = 30. But increasing 100 by 30% would be 100 + (0.3 * 100) = 1.3 * 100. Q: How do we know that .78 represents a 22% decrease and .84 represents a 16% decrease? How do we know whether we have an increase or a decrease? When we have sequential percent changes, we can express each percent increase, decrease, or "of" of a number as a multiplier. The sequential product of all the multipliers together will either be a number less than one or a number greater than one. If the product is a decimal less than one, we have a decrease. So when we get .78, we know that's a decrease, and the amount of decrease is: (1 - .78) = .22, which is 22%. So we have a 22% decrease. (1 - .84) = .16, which is 16%. So we have a 16% decrease. If the product is decimal greater than one, we have an increase. (1.68 - 1 = .68, which is 68%, so we have a 68% increase. If our product is one exactly, then that's just 100% of our original, so we had no change. 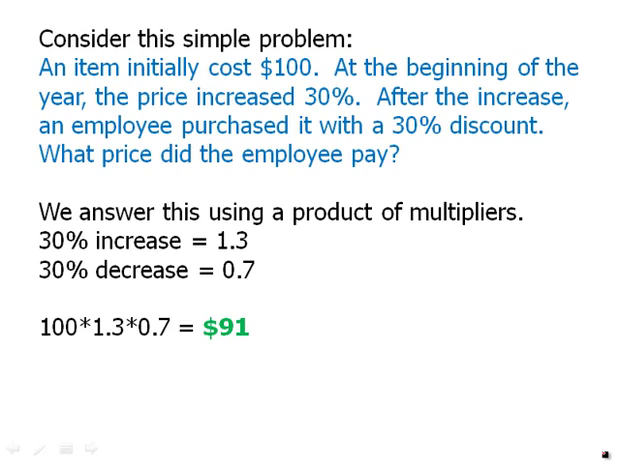 Example: What is the multiplier for: 60% of X increased by 60% then decreased by 60%? This final number represents 38.4% of our original X. Or we could say that it is a 1 - 38.4 = 61.6% decrease in X.
Sequential Percent Changes. So this is about when we have percent increase and decreases. There are a few common mistakes involving percent increases and decreases and the test loves to exploit these common oversights. They love to write problems where people make very predictable mistakes. These mistakes center on scenarios. Two or more percent changes follow in a sequence. For example you might have a certain percent increase in a price and then an employee will buy it with a certain percent employee discount and so you have a percent up, a percent down, how do they combine? So, for example, here's a typical problem. An item initially cost a hundred dollars. The beginning of the year, the price increased by 30%. After the increase, an employee purchased it with a 30% decrease, a 30% discount. What price did the employee pay? So pause the video right now, work on this on your own, and then restart. When you're ready. The first thing I'll say is that the answer is not $100. That is the trap answer. That is the predictable mistake answer. More than half the people who take the test will guess that, and they will be wrong. That is the most common mistake in this whole subject. The same percent up and then down, or down and then up, does not put you back in the same place. People think, oh a 30% up, 30% down they cancel. They absolutely do not, you do not wind up back in the same place. We answer this using a product of multipliers. Though a, a 30% increase, that's a multiplier of 1.3, a 30% decrease is a multiplier by, of .7. And so, we just multiply 100 by each one of those multipliers. So, 100*1.3*.7 gives us 91, and that's the actual price that the employ. Employee paid. Now this might be anti-intuitive for some people. Let's think about this. Starts out at 100, a 30% increase means it goes up to 130. Well then the employee comes along with a 30% discount, but they're not getting a 30% discount on the price of 100, they're getting a 30% discount on a price of. 130, and 30% of 130 is bigger than 30% of 100, which is why the amount it goes down is larger than the amount it goes up, which is why the employee ends up paying a price less than $100. Here's another problem. At the beginning of the year, the price of an item increased 30%. After the increase, the employee purchased it with a 40% discount. The price the employee paid was. What percent below the original price, in other words, what percent below the price before the increase. So, again pause the video, take a moment to work this out on your own. The first thing I'll talk about here is the mistake. The common mistake, people are gonna say, well up to 30%, then down 40%, 30 minus 40 is negative 10%. Must be a 10% decrease. Guaranteed, more than half, maybe even three quarters of the people who take the test, will fall into this trap. It's as if the test writers just set up a huge. Butterfly net. And people just run in to it. In hordes. It's absolutely 100% predictable. How many people make this mistake. That's why it's so important to recognize this, and understand not to make it. Whenever you have two or more percent changes in a row. Never add or subtract the percents. That will always be wrong. You never want to add or subtract percent increases and decreases. Instead, what do you do? Of course, we use multipliers. We always use. Use multipliers for percent increases and decreases. So a percent, a 30% increase that's a 1.3 multiplier. A 40% decrease that's a 0.6 multiplier. We're just gonna multiply those two multipliers. They multiply to 0.78. 0.78 is the multiplier for a 22%. Decrease. And so, this means that what we having going on here is a 22% decrease. The price that the employee paid, was 22% less than the original price. Here's another. The price of a stock increased 20% in January, dropped 50% in February and increased 40% in March. So in other words, that's the first quarter of the year. Find the percent change for this three month period, the percent change for the first quarter. So again, pause the video here and see if you can work this out. The first thing I'll say is that of course the mistake answer, the thing, the very predictable mistake that more than half the people who take the test will make, they're just gonna do plus 30 minus 50 plus 40. That it gives us positive 10, so it must be a 10% increase. That's the mistake that people are gonna make. Again, a very predictable mistake, that test writers absolutely love it when they can write a question that has such a predictable mistake. That's why it's so very important to understand the nature of this mistake, so you don't fall into this trap. Trap. Of course, again, we're gonna use multipliers. The multiplier for 20% increase, 1.2. The multiplier for 50% decline, that's 1.5. The multiplier for 40% increase, 1.4. We're just gonna multiply those three. To make things simple, I'm first gonna multiply the last too. 1.5, or one half. That is 1.4 will give me .7. and then .7 times 1.2, gives me .84. That is the multiplier for a 16% decrease. And so that's what's happened here: for the first quarter of the year, the stock. Decreased 16%. So in this topic, it's very important to understand both the nature of the mistakes, the very tempting mistakes as well as to understand what the right thing is to do. Mistake number one, an increase and decrease by the same percent do not. Get us back to the same original starting point. Mistake number two, in a series of percent changes, never add and subtract the individual percent, that will be wrong 100% of the time. Instead, what we're always gonna do is figure out multipliers and multiply all the individual multipliers together.